Imagine if all the best restaurants around Halifax and Nova Scotia got together in one place, made a crap load of food, and served the best of the best in spirits. 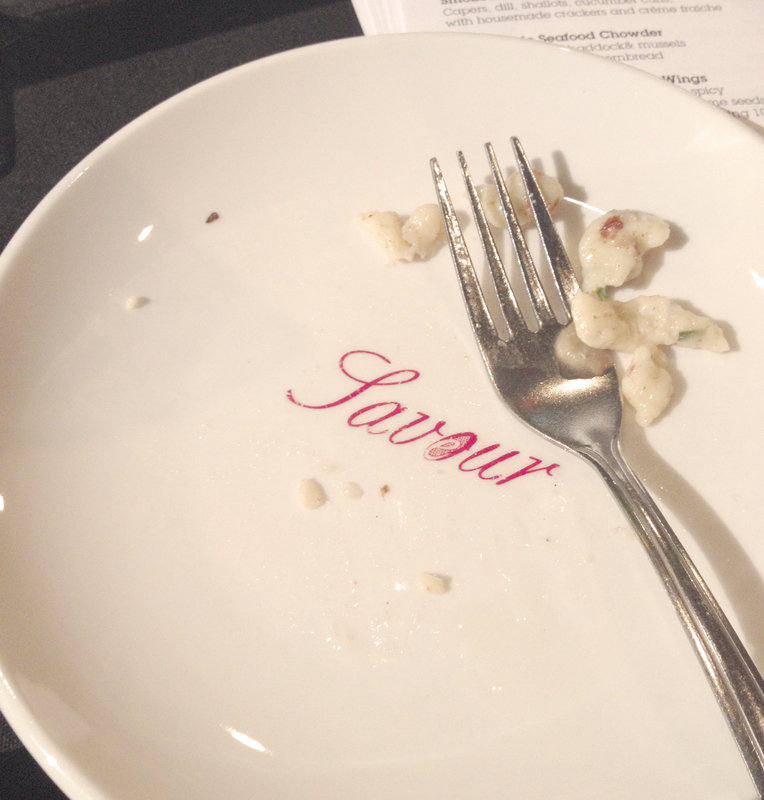 Oh wait, it happens every year at Savour Food & Wine Show where I ate all the food. 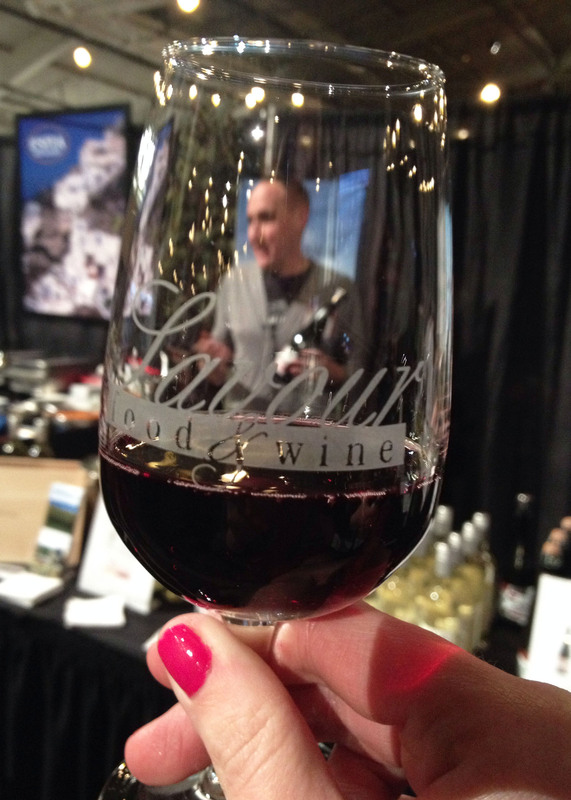 Last Thursday was the 11th annual Savour Food & Wine Show and, hosted at the Cunard Centre, it is pretty much every food lover’s dream. There are dozens of small plates to try, the local wine is flowing, and it is a damn good time. I was lucky enough to attend the event with my friend Janet, and we circumnavigated the booths with two other local blogging goddesses Kelly Neil and Kayla Short like we were on a mission to take over the world. And, if I do say so myself, we did a pretty good job of eating everything that we could get our hands on. One of the first stops of the evening was at Blomidon Estate where we got to sample one of their newest wines, Blomidon BMD, a sparkling red wine. That’s right, a sparkling red. Served deliciously cold, it was fruity, effervescent and wayyy too easy to drink: I went back three times throughout the evening for another glass. Another early stop was Domaine de Grand Pré’s restaurant, Le Caveau. 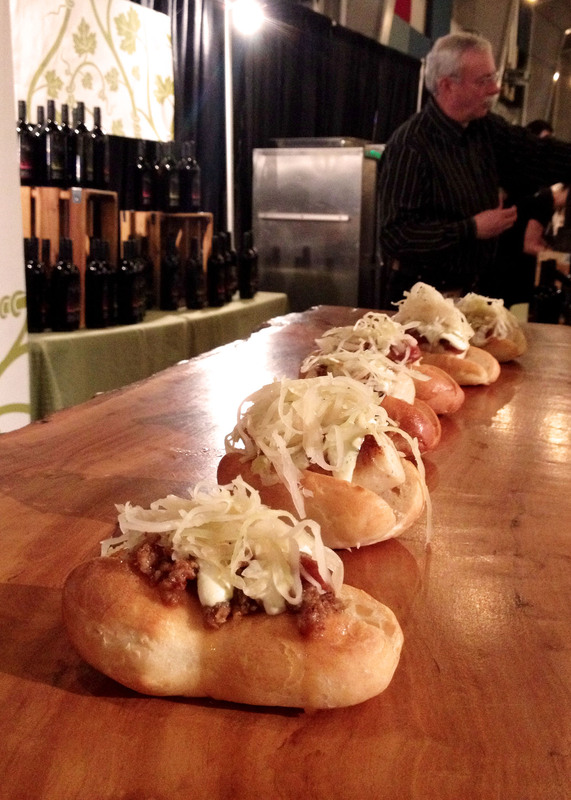 As soon as we heard Chef Jason Lynch was prepping scallop hot dogs, we made a beeline for the booth! 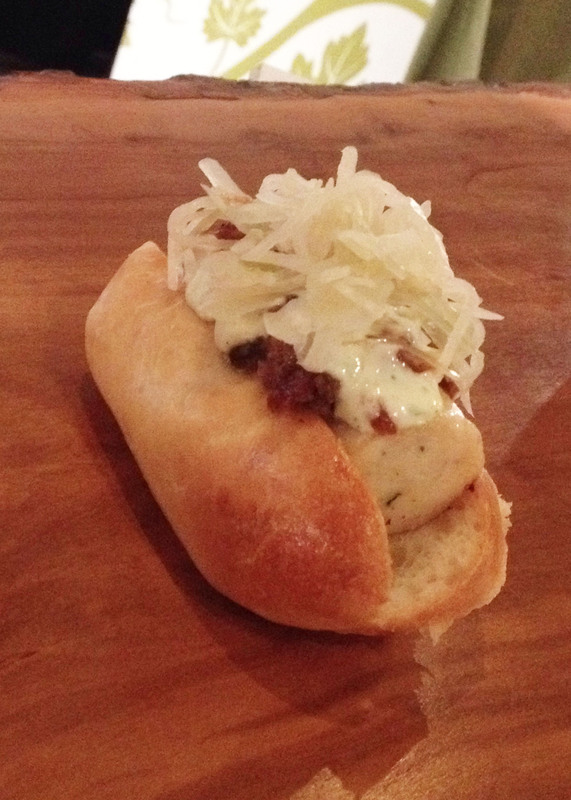 Probably one of my favourite bites of the evening, this delicious little morsel of scallop sausage was cradled in a homemade brioche bun and piled high with Jason Lynch’s famous bacon jam and sauerkraut with a tarragon aioli. How could you not love this dog? Estia had a plethora of Greek deliciousness happening. 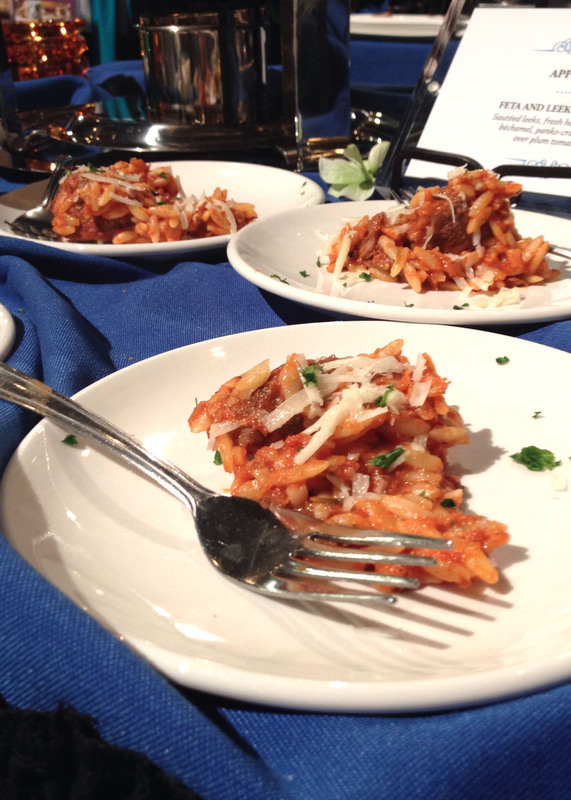 We sampled the Feta and Leek Croquettes and Lamb Youvetsi, a dish with succulent lamb and orzo pasta in a tomato sauce with cinnamon, clove, and rosemary. SO good. 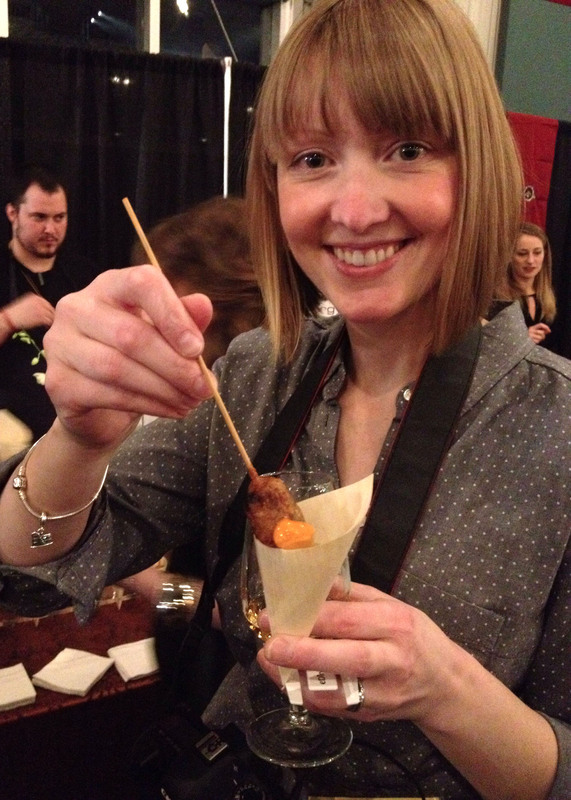 At Onyx’s booth there was a whole lot of fusion going on with delicious little Kobe Corn Dogs. Served with Gochujang Aioli this was a big hit with us bloggers; look at the lovely Kelly just digging it! Another of my favourite dishes of the evening was from Canvas Resto Lounge, the new restaurant in the Cambridge Suites Hotel. 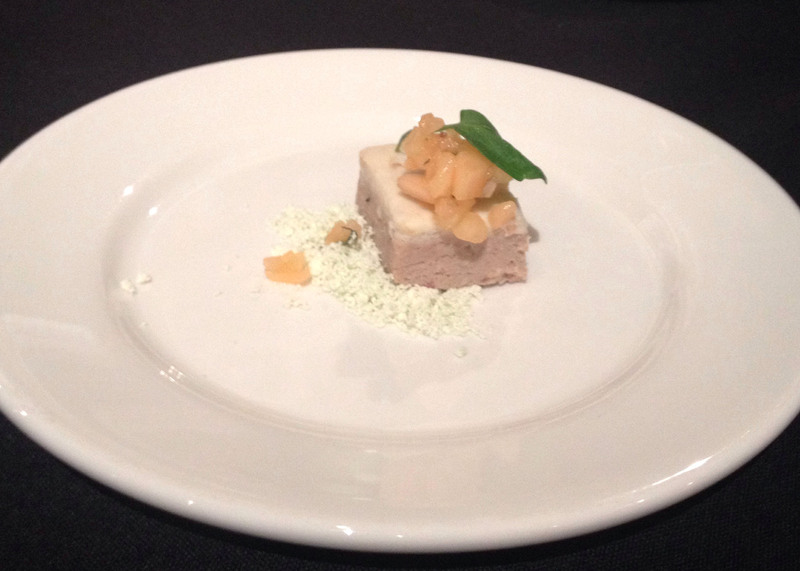 The Country Pork Paté with Smoked Scallop Mousse, Pickled Melon Salsa and Watercress was a parcel of flavour that exploded in your mouth. I seriously don’t even understand how all that awesome was compacted into such a small (and beautiful) bite. 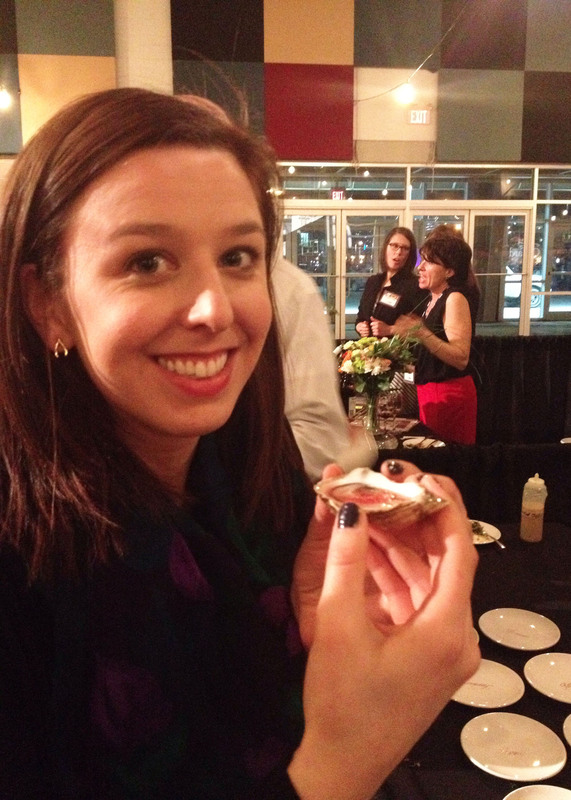 Janet tried her first oyster at Savour! The Press Gang’s peeps were shucking as fast as they could to keep up with all the patrons slurping down the delicious Oysters with Iced Watermelon and Cucumber. (Janet loved it by the way). Have you tried pig trotter before? Well if you went to Savour you would have! 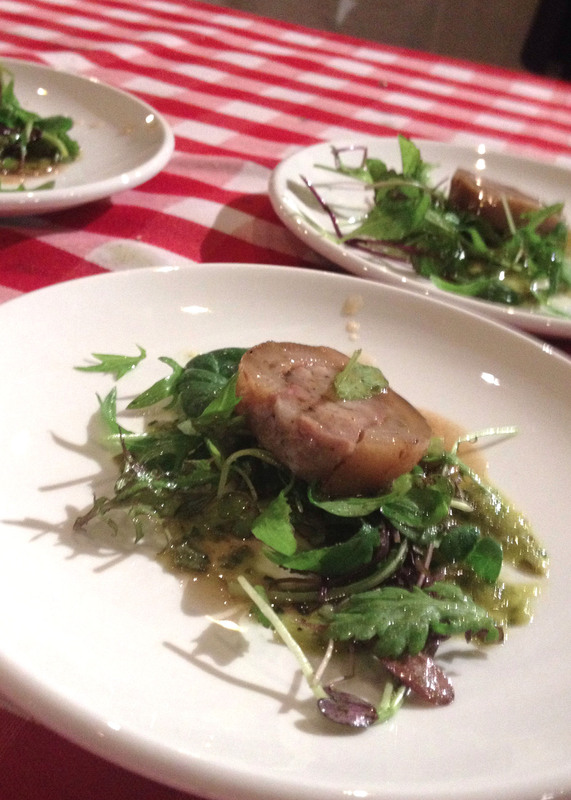 Ratinaud French Cuisine served up Stuffed Pig Trotter with Micro-Greens and Green Onion Sauce and man was it delicious! Another top contender for dish of the evening was from Morris East. The Herbed Spaetzle with Sauteed Mushrooms and Finished with Truffle Oil and Grated Parmesan was a huge hit with our little blogger party and I didn’t even have time to take a photo because we all gobbled it up so fast! 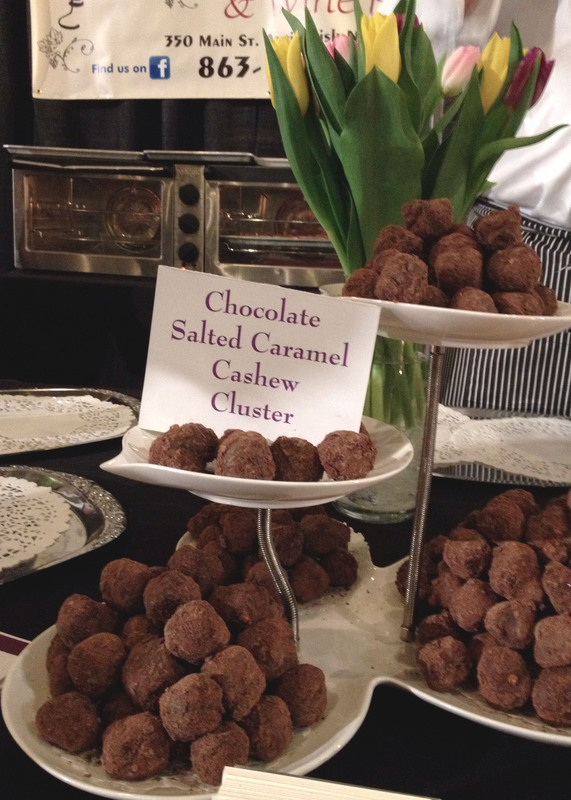 The desserts were plentiful at Savour on Thursday night. Two of my favourite desserts just happened to be at the same booth! 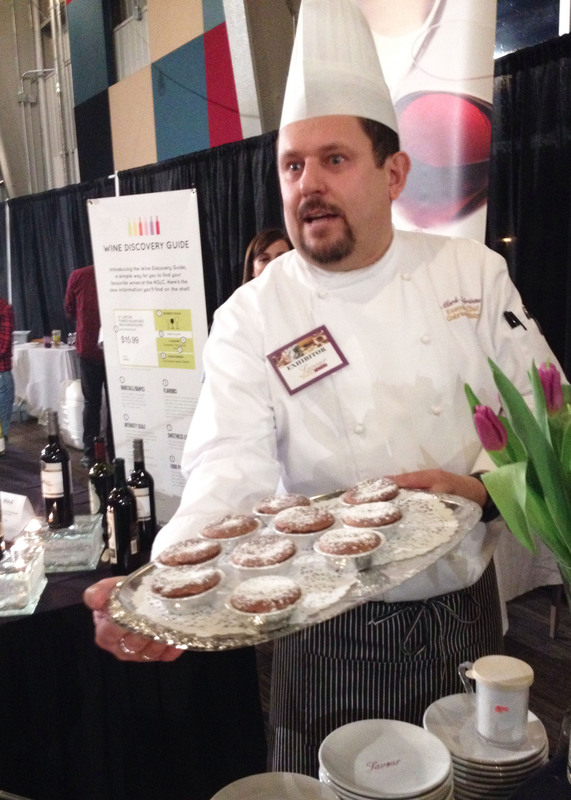 Chef Mark Gabrieau from Gabrieau’s Bistro in Antigonish was serving up all the chocolate deliciousness with Gran Marnier Chocolate Soufflés and Chocolate Salted Caramel Cashew Clusters. Heaven. Overall, Savour Food & Wine Show was like Christmas morning for food. 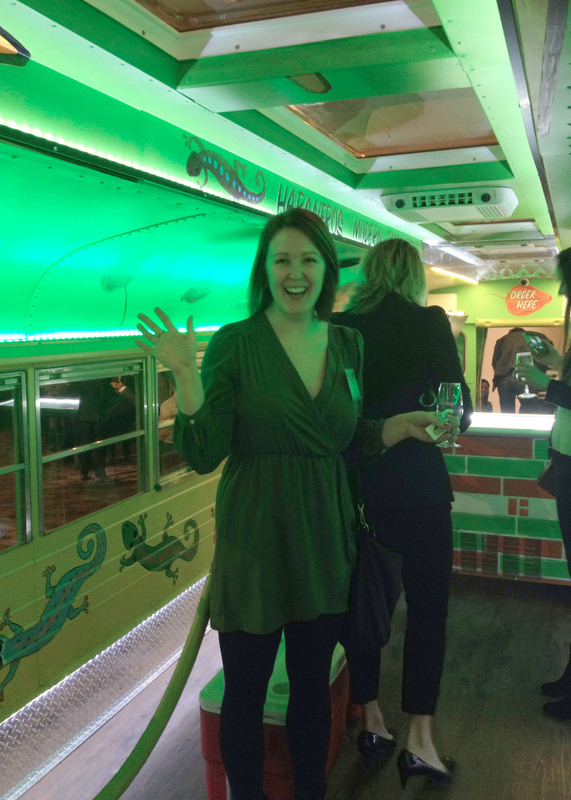 I got to drink lots of delicious local wine, try so many different types of cuisine made by the best chefs in the province, AND I got to hang out on a giant gecko-shaped food truck (and try some of Habaneros‘ awesome tacos)! There is yummyness everywhere, and with spirits flowing, awesome music, and a wonderful crowd, this night is not to be missed. Savour it! Everything looks amazing! I bet that BMD would be delicious served with a chocolate dessert.